He also happens to be the mascot of Technoccult (the web site, not the Invisbles "character"). 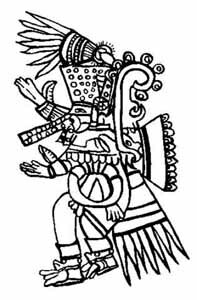 Oddly enough, I never even noticed that Tezcatlipoca was part of Fanni's shaminism. The character was selected as a mascot, actually, because Brenden Simpson used a picture of him as a place holder in a Technoccult re-design and I just happened to like the look of it. Weird coincidence. For the record, I didn't even get the name for Technoccult from the Invisibles. I came up with it on my own, thinking it had a nice "cybergoth" ring to it. Also, the guy who runs disobey.net says he used to publish a zine/newsletter on BBSs back in the late 80s called Technoccult and still uses it as a category name on his blog. Ah, fancy the synchronicity then! How appropriate for our new partnership. :) Re-reading Invisibles is bringing all sorts of stuff into my head and my world. The hypersigil is working! Glad to see its all weaving together nicely. The Projector Pros works directly with the world's top manufacturers to provide you with the best selection of products including projectors, plasmas, TVs, accessories, and more. Your readers my enjoy other resources such as ways to pass a drug test and knowing some of the best sites to buy ways to pass a drug test .